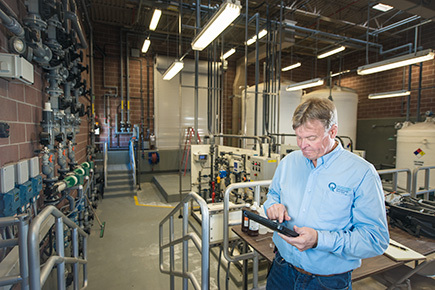 How much drinking water will your plant use for facility processes and employee consumptive use? Estimate the peak day demand (gpm) and annual total demand (acre-feet). What are the fire suppression requirements for your plant? For example, 2,000 gpm for a 2-hour duration. Will your plant obtain drinking water from an existing municipality? If yes, name the municipality. Will your plant have to develop a new well to provide drinking water to your plant? If yes, the “Outline of Well Approval Process” on the attached sheet must be followed. Do you have plans to insure no cross-connections occur? engineering plans and specifications governing the well drilling. Grouting Inspection During Well Construction: An engineer from the Division, or the appropriate district engineer of the Department of Environmental Quality, or an authorized representative of the State Engineer’s Office shall be contacted at least three days before the anticipated beginning of the well grouting procedure (see R309-515-6(6)(i)). The well grouting procedure shall be witnessed by one of these individuals or their designee. a bacteriological analysis of water obtained from the well after installation of permanent equipment, disinfection and flushing. An Operation Permit shall be obtained in accordance with R309-201-9 before any water from the well is introduced into a public water system. The public water supplier shall submit a DWSP Plan in accordance with R309-600-7(1) for any new ground-water source of drinking water within one year after the date of DDW’s concurrence letter. In developing this DWSP Plan, PWSs shall refine the information in the PER by applying any new, as-constructed characteristics of the source (i.e., pumping rate, aquifer test, etc. ).